Google Earth Pro for everything from planning hikes to placing solar panels on rooftops. Google Earth Pro has all the easy-to-use features and detailed imagery of Google Earth, along with advanced tools that help you measure 3D buildings, print high-resolution images for presentations or reports, and record HD movies of your virtual flights around the world. in Finland right from Google Maps. Also known as the aurora borealis (after Aurora, the Roman goddess of the dawn, and Boreas, the Greek name for north wind), these dazzling lights are the effect of charged particles interacting with one another in earth’s atmosphere. These light displays have long been a source of wonder for poets and travelers gazing up at the otherworldly colors in stark contrast with the austere, arctic terrain. However, they can only be seen in person at certain latitudes and times of year, making this breathtaking sight a rare experience for most of us. 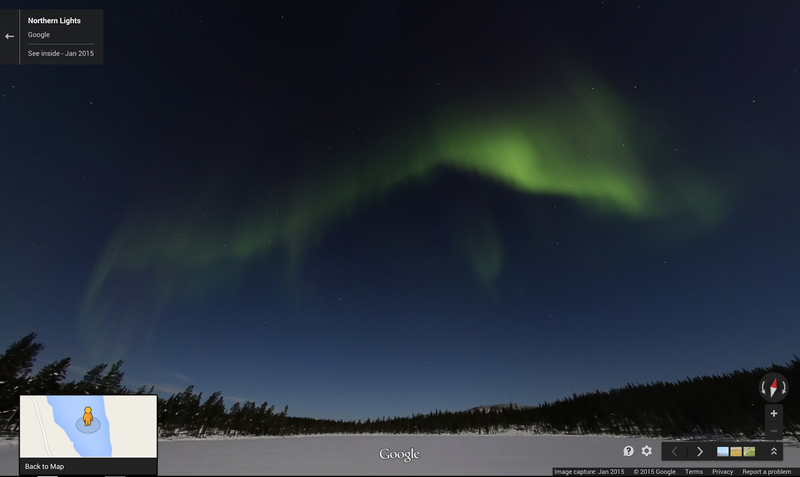 To see more views of the Northern Lights, explore the Google Maps gallery. Click across the frozen lake in Finland where these shots were captured, and take in the awe-inspiring views above. Nature’s greatest light show has come to Google Maps for the first time. Starting today, armchair arctic explorers, science lovers and curious observers will be able to explore the Northern Lights in Finland right from Google Maps.